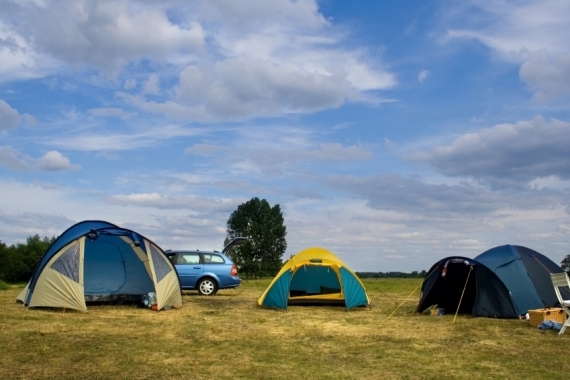 The all-new 2012 Toyota Prius c is the answer to an increasingly common question among the hybrid faithful: “Since when did the Prius get so expensive? !â€ Indeed, if you want to get into a regular Prius for 2012, it’ll run you at least $24k, and likely a good deal more when all’s said and done. That’s real money, especially in these uncertain times. Mass-market hybrids are cool and all, but they can be a tough sell when you have to drop near-luxury cash to score one. 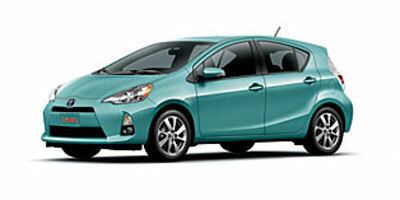 Enter the 2012 Prius c, which starts at $18,950. Now that’s more like it. Based on the subcompact Yaris, the Prius c employs the same hybrid technology under the hood as the regular Prius, albeit with a smaller 1.5-liter gas engine aboard. Power is thus in short supply, but the Prius c matches the regular Prius’s astounding 50 mpg fuel economy, which is sure to please the I-heart-hybrids crowd. Caveat emptor: thanks to its stiff-legged Yaris underpinnings, the Prius c rides more firmly than the cloud-like regular Prius, so you’ll be reminded that you chose the cheap one every time you hit a bump. But in most other respects, the Prius c does a commendable Prius impression for thousands less. Its diminutive dimensions are a boon in tight quarters, too. In the Prius c, the cost-conscious hybrid faithful have their answer, and we think it’s a pretty compelling one. 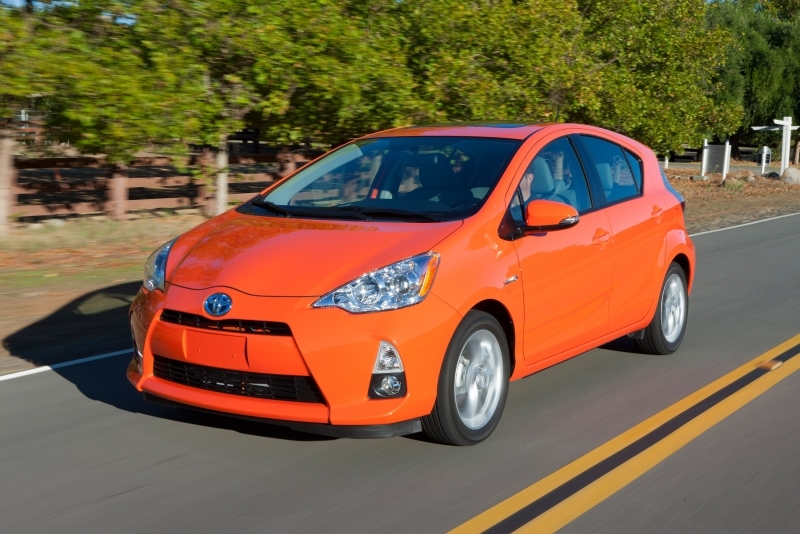 The Prius c gets stellar gas mileage, just like its bigger sibling. Its subcompact size makes it a good fit for urban life. Every Prius c comes standard with iPod/USB and Bluetooth connectivity. The backseat is surprisingly adult-friendly, and the Prius c’s hatchback body style provides useful hauling capability. As hybrids go, we think the Prius c is attractively priced. No two ways about it, the Prius c is slow, and the gas motor makes bovine noises at full whack. 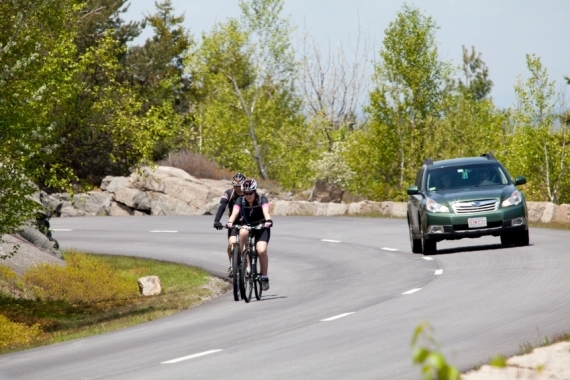 The ride and steering are awfully firm for a car whose primary purpose in life is to sip fuel. 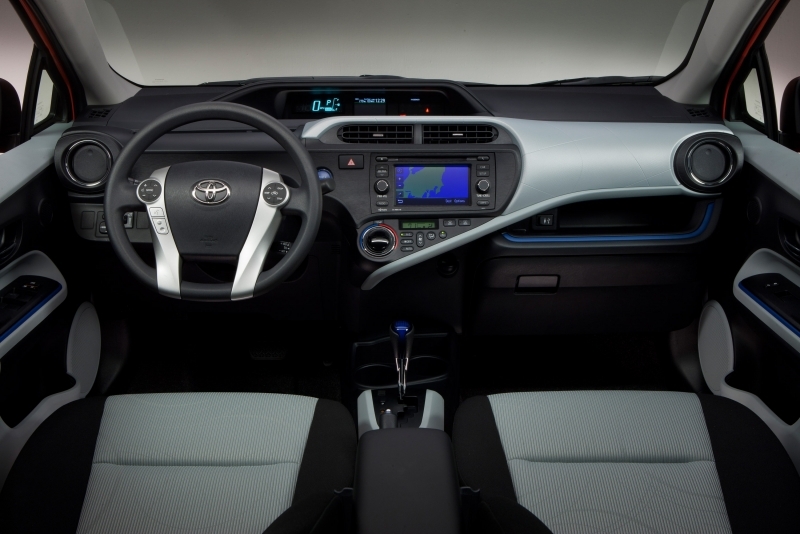 The dashboard design isn’t as sleek as the regular Prius’s, and the steering wheel doesn’t telescope out far enough. 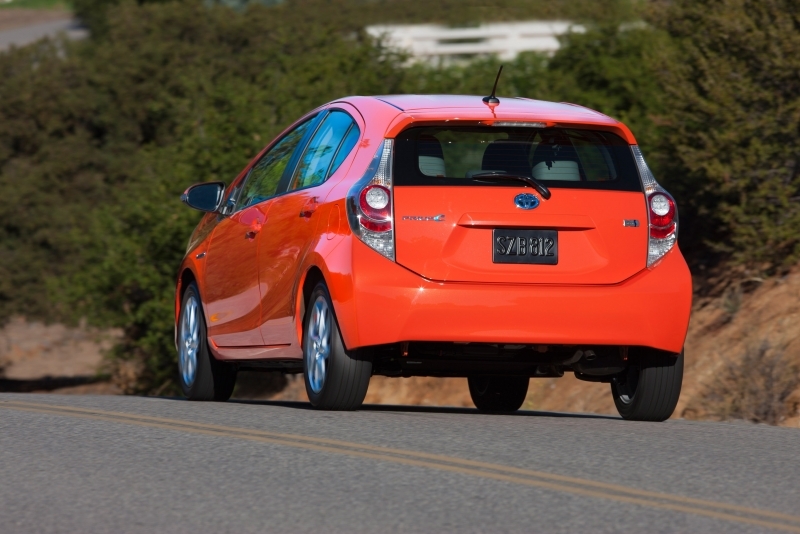 We were immediately struck by the Prius c’s relatively high steering effort, especially by easy-peasy Prius standards. Unlike the regular Prius, the Prius c can’t comfortably be maneuvered through a parking lot with a couple fingers. Moreover, the Prius c’s ride quality borders on stiff over patchy pavement. Toyota tells us that this is by design—the engineers wanted to add a sporty edge to the Prius c in case owners wish to “toss it aroundâ€—but we suspect it has more to do with the inherent limitations of the short-wheelbase Yaris platform. On the upside, the Prius c’s cabin remains commendably quiet, even at highway speeds. Also, while we’re not sold on the, er, sporty steering effort, we love the compact steering wheel and the tidy turning circle it affords. This car is far from unpleasant to pilot; it’s just that, having driven the exceptionally smooth regular Prius on numerous occasions, we expected more similarities between the two. Happily, the similarities under the hood are plentiful, as the Prius c gets a modified version of the regular Prius’s familiar “dual-modeâ€ hybrid drivetrain. The gas engine is a 1.5-liter inline-four on the Atkinson cycle, and it’s complemented by an electric motor that’s powered by a battery pack under the backseat. Total system output is just 99 horsepower, which makes the Prius c is one of the slowest cars on the road, even with just 2,500 or so pounds to carry. Like the Prius (and the rest of Toyota’s hybrids, for that matter), the Prius c can operate solely on electric power at low speeds if you go (very) easy on the throttle, and the gas engine also shuts off in most coasting scenarios. That’s largely how it achieves its otherworldly fuel economy. Don’t expect a Chevy Volt-like electric experience, however, as the Prius c’s driver-selectable “EV Modeâ€ is something of a sham—its maximum speed is 25 mph, and if you dip into the throttle even a little, the gas engine wakes right up, which is no different from the car’s normal modus operandi. The EPA pegs the Prius c’s fuel economy at a glorious 53 mpg city, 46 mpg highway, and 50 mpg combined, tying the regular Prius for first place among non-plug-in cars for 2012. The Prius c comes standard with iPod/USB and Bluetooth connectivity, which is laudable at its sub-$20k starting price. There’s also the expected array of digital gauges and power-flow diagrams on the dashboard—Prius purists will feel right at home. But the big technological news here is the availability of Toyota’s new Entune system (Three and Four trim levels only), a smartphone-based platform that leverages your (hopefully unlimited) data plan to bring handy mobile apps like Pandora and OpenTable into the driving experience. It gives you real-time access to weather and news, too. The Prius c’s Entune package includes a 6.1-inch touchscreen—that’s where the apps are displayed—and a navigation system. Pretty cool stuff in a reasonably priced car. The Prius c’s dashboard lacks the sleekness of the regular Prius’s—due to packaging constraints, Toyota couldn’t replicate the larger model’s Star Trek-style cockpit here. But the Prius c still gets spaceship points for all the gizmos it gives the driver, and while the interior materials aren’t up to the regular Prius’s standards, there are enough different textures on the dashboard to keep things interesting. The standard front chairs are actually our favorites with their fixed headrests and surprisingly substantial side bolsters. As for the backseat, it’s surprisingly commodious – Volt owners, eat your hearts out. 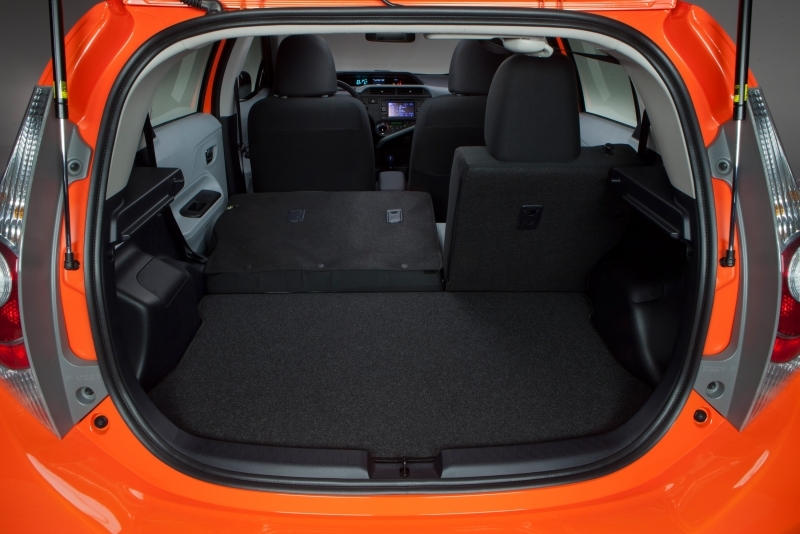 While the Prius c’s cargo hold is expectedly compact at 17.1 cubic feet, the rear seatbacks (or “seatback,â€ singular, in the base model’s case) fold down to create a handy box-shaped cargo hold. We think the Prius c’s stylists have performed a generally successful Prius-ification of the humble Yaris, a considerably cheaper car. The shorter wheelbase gives the Prius c a distinctively stubby profile, but there’s no mistaking the Prius DNA here. Notably, while the optional 16-inch alloy wheels may add some curb appeal, they come with even firmer steering and ride calibrations. If there’s one bogey squarely in the Prius c’s sights, it’s the Honda Insight, which was previously the only compact four-door hybrid offered under $20,000. The Insight’s fuel economy pales in comparison, though some might enjoy its driving character a bit more. As for non-hybrid hatchback alternatives, they’re plentiful. We’d focus on standouts like the satisfying Chevrolet Sonic LTZ, the practical Honda Fit, and the surprisingly cool Kia Rio. Aside from its firm ride and steering, the Prius c is basically a bull’s-eye for Toyota, offering full Prius fuel economy at a fraction of the price. Things are about to get real all over again in the Whole Foods parking lot.